Dans sa version imprimée, le Figaro propose tous les vendredis un supplément constitué d’un choix d’articles du New York Times traduits en français. C’est toujours une lecture enrichissante, avec des articles variés et approfondis sur des sujets intéressants. A ce titre, la sélection d’articles est judicieuse et bien pensée. Malheureusement pour le Figaro, il est facile de trouver les articles originaux en anglais sur le site internet du New York Times. Malheureusement car j’ai déjà fait part sur ce blog de ma surprise en comparant la version traduite et la version originale d’un même article et en notant que des passages n’étaient pas traduits ou que certaines expressions trop critiques ou trop subjectives étaient atténuées. Ce « lissage », pour ne pas dire censure, n’est pas neutre: il révèle une intention et un projet parfaitement lisibles en creux. Voyez un exemple de ce travail de « modération » effectué par le Figaro dans Repas gastronomique français à l’UNESCO: la petite cuisine du Figaro. Le sujet traitant des risques pour le repas gastronomique français de perdre son label UNESCO pouvait apparaître sensible dans un journal qui n’est pas particulièrement agressif vis-à-vis du gouvernement actuel. Je ne pensais donc pas retrouver les ciseaux du Figaro dans un autre article publié en français le 16 mars dernier en français et le 3 mars dans le New York Times. C’est un article traitant des différences entre France et Allemagne à travers le portrait de deux villes distantes l’une de l’autre de quelques kilomètres (Sélestat en France et Emmendingen en Allemagne). Lien web vers l’article ici. SÉLESTAT, France — This ancient town in the center of Alsace boasts the extraordinary Humanist Library, dating from the 15th century. But less proudly, Sélestat also has an unemployment rate of about 8 percent, much higher than towns just across the border in Germany. Emmendingen, a German town of 27,000 that is only slightly larger than Sélestat and barely 20 miles away, has an unemployment rate of under 3 percent. Among those under 25 years of age, the unemployment rate in Sélestat is 23 percent; in Emmendingen, it is 7 percent. The divergent economic circumstances of these two towns are striking, particularly given the cross-border cultural ties in the region. The reasons for the disparities, much debated, have emerged as a focal point of the French presidential campaign. Fighting for his re-election, President Nicolas Sarkozy of France has said with characteristic bluntness that the French should become more like the Germans. In a recent joint television interview with Chancellor Angela Merkel of Germany, he raised Gallic eyebrows by mentioning the word Germany or German at least 15 times, or about once a minute. But the issue for Mr. Sarkozy is job creation. Unemployment in France is at a 12-year high and rising. Germany’s unemployment rate, at 7.4 percent, is at its lowest point since reunification in 1991. If re-elected, Mr. Sarkozy proposes a national referendum to approve a more flexible labor market, featuring a German-style apprenticeship. He wants to allow more part-time work, like the Germans, and to subsidize more jobs for youth and raise the value-added tax to reduce the cost of social-welfare charges for employers, as the Germans do, too. (en VF, un passage a été ajouté ici) His Socialist opponent, François Hollande, rejects most of those ideas, preferring more traditional Socialist responses like more state spending on education and job creation. Many French admire the Germans but do not want to emulate them. Mr. Sarkozy and Mrs. Merkel have had a strained relationship, but it has improved markedly in the pressure cooker of the euro crisis, and Mrs. Merkel once had plans to campaign for him. But she appeared to back off recently when it seemed that her open support might hurt Mr. Sarkozy more than help, by wounding French pride and making him look like a supplicant. Nevertheless, Mr. Sarkozy is betting that the problems in the French economy, where youth unemployment is 23 percent nationwide and exports are declining, are so profound that voters will overcome their deep-seated reluctance and be more receptive to at least a variation on the German model (en VF, un passage a été ajouté ici). But it is not always clear what that would entail, and whether the French would ever stand for it. One thing is abundantly clear, however. The German economy has powered far ahead of France’s, and the gap is widening every year. Germany has maintained its industrial base and competitive edge, both technologically and in terms of cost, while France lacks a large sector of medium-size industrial enterprises and depends much more on services (passage déplacé plus haut en VF). The French share of global exports has steadily fallen, while the German share has steadily risen. French salaries have increased in real terms while German salaries have fallen, making French workers more expensive and thus less productive and competitive. French social protections for the unemployed are also much more lavish, especially after the Germans pushed through the so-called Hartz reforms, which largely limited unemployment benefits to 12 months. In France, the duration is 23 months for those under 50 and three years for those over 50, many of whom never work again. In part to pay for those benefits, the cost to business of an hour’s labor is 11 percent higher in France. But there is less job security in Germany, and more Germans do part-time work. The Germans do not have a centrally fixed minimum wage, as the French do. The practical results of these trends are visible in these border towns, where the shape of industry — largely small- to medium-size metal-working companies or factories — is similar. For example, there are 10 times as many job offers a month on the German side as on the French one, said Norbert Mattusch, who works on cross-border cooperation for the German Federal Employment Agency in Freiburg. While some Germans cross the border to work in France, few French do the same, except for seasonal labor at the large amusement park nearby, Europa-Park, the largest in Germany and the third-largest in Europe, which draws many French-speaking customers. “We have job openings right now for 70 drivers of heavy trucks,” Mr. Mattusch said. “But the big problem is that the French don’t speak German,” so they cannot qualify for the jobs, and young people here no longer speak the Alsatian dialect, once used on both sides of the border. The mayor of Emmendingen, Stefan Schlatterer, says that “there is a job here for anyone who can count to ten,” but one needs to count in German. Salaries on the German side are higher for similar work, goods are cheaper, the cost of hiring a full-time employee is lower and the relationship between German workers and their bosses is more supple and flexible, freer of the centralized regulations, ministries and unions characteristic of France. Boris Gourdial, director of the Freiburg branch of the German Federal Employment Agency, said that mentalities were different, despite shared history and proximity. “The French work to live and the Germans live to work,” he said, a cliché that still resonates. Many labor experts single out the German apprenticeship system as a major competitive advantage. It takes young people out of the university track at 16 and trains them in industrial skills, as they simultaneously study for a technical degree and work for a salary. They often get full-time jobs with companies that have invested in training. Unlike in the rest of France, there is a vestigial apprenticeship system in Alsace, which was at different times a part of Germany. But it is closer to a French “alternance” model of vocational training, which also combines education and work, but is less widespread among companies and less popular. But she is beginning to see a change, she said. “Companies here are working with schools to promote apprenticeships,” and more young people see the advantage of a salary at a decent job as preferable to unemployment. Mr. Bauer, mayor since 2001, has also been promoting more bilingual classes, so local students will learn some German. He has been trying to promote more regional partnership with the Germans, including with Emmendingen’s mayor, Mr. Schlatterer. L’article original en anglais comprend 1470 mots. Une fois amputé des passages non traduits, il ne comprend plus que 738 mots, soit une sérieuse cure d’amaigrissement de la moitié de l’article. Le Figaro a certainement des contraintes en nombre de signes pour ce supplément du vendredi. Il serait peut-être opportun de signaler au lecteur français que ce n’est pas un article du New York Times qu’il a sous les yeux mais l’aperçu ou l’extrait d’un article du New York Times. Si les traducteurs du Figaro doivent tailler dans l’article original pour des contraintes éditoriales, il est intéressant de voir comment s’opèrent leurs choix. Par exemple, quand Steven Erlanger rapporte des propos de Nicolas Sarkozy qui s’exprime « with characteristic bluntness » (« avec son franc-parler caractéristique »), pourquoi ne pas traduire cette expression qui dénote un jugement du journaliste et en même temps décrit une réalité? Est-ce considéré comme trop offensant pour apparaître dans le Figaro? 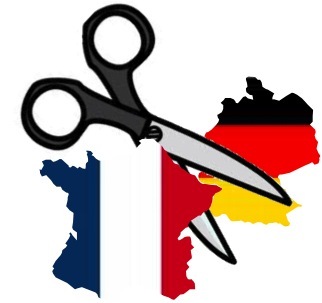 La même remarque vaut pour cette phrase non traduite: « In a recent joint television interview with Chancellor Angela Merkel of Germany, he raised Gallic eyebrows by mentioning the word Germany or German at least 15 times, or about once a minute. » (« Dans un récent entretien télévisé avec la Chancelière d’Allemagne Angela Merkel, il a haussé des sourcils gaulois en mentionnant le mot Allemagne ou allemand au moins 15 fois, ou au moins une fois par minute. ») Peut-on mentionner dans le Figaro les sourcils gaulois de Nicolas Sarkozy vantant les mérites de l’Allemagne? Moins anecdotique, c’est à présent un élément de diagnostic établi par Steven Erlanger qui passe à la trappe. Quand il décrit les relations entre Nicolas Sarkozy et Angela Merkel, et notamment la décision de cette dernière de moins afficher son soutien au Président français, Steven Erlanger estime que « her open support might hurt Mr. Sarkozy more than help, by wounding French pride and making him look like a supplicant » (« son soutien ouvert pourrait plus affecter M.Sarkozy que l’aider, en blessant la fierté française et en le montrant dans la position de quémandeur »). De même, lorsqu’il évoque l’idée de Nicolas Sarkozy de décliner le modèle allemand à la française, le journaliste américain note: « But it is not always clear what that would entail, and whether the French would ever stand for it. » ( « Mais il n’est pas toujours très clair de savoir ce que cela impliquerait et si les Français seraient prêts à l’accepter. ») Ensuite, le Figaro supprime un long passage comparant les systèmes sociaux français et allemand pour amortir les effets du chômage. Les autres passages significatifs qui ont été supprimés se rapportent au système d’apprentissage, notamment aux spécificités du modèle alsacien qui a été en partie influencé par le modèle allemand. Le maire de Sélestat est particulièrement fier de ce modèle local, « which he thinks should be developed in the rest of France » (« qui, selon lui, devrait être développé dans le reste de la France »). Il sera content d’apprendre que son vœu ne sera pas formulé dans la version française de l’article du New York Times. Il en va de même avec la promotion de classes bilingues par la commune de Sélestat, un détail que supprime le Figaro alors même que Norbert Mattusch, responsable d’un organisme type Pôle Emploi, déplorait le fait que les Français ne parlent pas allemand – et ne peuvent donc pas être recrutés alors même qu’il y a de nombreux emplois « for anyone who can count to ten » (« pour n’importe qui pouvant compter jusqu’à dix »… en allemand). Mais ces informations importantes se trouvent dans le long passage supprimé au milieu de l’article. Est-ce le fait de promouvoir la langue allemande en France ou de constater qu’il y a en Allemagne des emplois pour n’importe qui pouvant compter jusqu’à dix, qui dérange le plus le Figaro? Il est pourtant plus que temps de regarder la réalité en face pour proposer des solutions pragmatiques aux difficultés que nous connaissons. Ce n’est pas en regardant la réalité de profil comme dans cette version tronquée de l’article du New York Times que nous y parviendrons. Cet article a été écrit le mercredi 4 avril 2012 à 15:34	et est classé dans Allemagne, Analyses, Communication, Europe, France, Pays. Vous pouvez suivre toutes les réactions par le flux RSS 2.0. Très intéressant article. Il ne m’était jamais venu à l’esprit qu’un journal comme le Figaro puisse se permettre de traduire des extraits sans le signaler expressément. De plus l’article dont vous parlez est intéressant et je ne l’aurais pas lu si vous n’aviez pas décidé d’en parler. Merci donc pour les deux aspects de votre article. Ce qui m’étonne, c’est que l’article soit présenté comme écrit par Steven Erlanger (le nom de l’auteur) et qu’il soit à ce point tronqué. De deux choses l’une, soit M. Erlanger en fait une version écourtée (édulcorée) pour le Figaro – qu’il écrit/coupe lui-même, soit il y a là une sérieuse atteinte au droit d’auteur, puisque le sens de son article est fortement changé/atténué à cause des coupures/ajouts. Que dit le chapeau de la section NYT du Figaro ? Explique-t’elle comment ses articles sont choisis/ traduits ? Si vous lisez le supplément du vendredi, vous ne trouverez pas d’indication spéciale sur le mode de sélection et de traduction des articles du New York Times. Alors, de deux choses l’une: soit les traducteurs français du Figaro font eux-mêmes le choix d’amputer les articles originaux, soit ils traduisent intégralement et fidèlement et ensuite c’est la rédaction du Figaro qui sort les ciseaux pour sabrer dedans. Par ailleurs, je signale que le site Arrêt sur images vient de mentionner cet article.